To many seniors, in-home care sounds frightening. Why would a seemingly capable person need help from a stranger? Your loved one may feel intimidated or stressed, but Granny NANNIES is here to make sure the transition to in-home care goes smoothly for your loved one. In-home care is exactly what it sounds like—your loved one being cared for in the comfort of their own home. This is an excellent option because living in a familiar place means less stress due to environmental change. It also means increased feelings of safety where your loved one knows his or her surroundings. When researching in-home caregivers, do thorough research to avoid fraud or abuse. By choosing Granny NANNIES, you can be assured that the referred caregivers are Certified Nursing Assistants (CNAs) or registered Home Health Aides (HHAs) who have passed rigorous background checks. By working closely with your loved one, the CNAs and HHAs will gain the trust needed for a support system to grow. It’s not uncommon for friendships to blossom between caregiver and patient. To facilitate that system, a few things are necessary. Make sure the CNA or HHA and your loved one are on the same page regarding what’s expected of them, including daily schedules and what services will be provided. Alongside therapy and other preventative actions, CNAs and HHAs assist in routine, daily activities, personal care and monitoring of cognitive risk factors. With so many baby boomers reaching an elderly age, the in-home health care industry is growing rapidly. 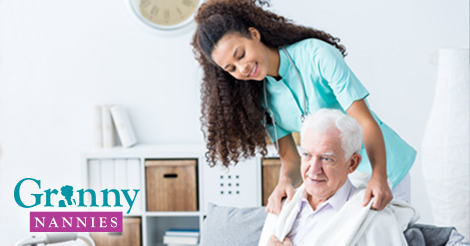 Granny NANNIIES has been ahead of the curve for over 25 years and the CNAs and HHAs referred by Granny NANNIES are trained to provide the special care required to make the transition to in-home care a successful one.